It was probably inevitable that I would end up with a fabric stash problem. I’m a pack rat by nature, I like to have things around that just might come in handy someday. I don’t mind having some basics (and not-so-basics) kicking around for when the urge strikes. What I have more trouble coming to terms with is the scraps. I can’t seem to throw away anything bigger than a square foot, so a frustrating portion of the stash ends up being these pieces lingering from finished projects. They do come in handy—for contrast details, bias tape making, piping, pocket linings; and the kids will dive through them from time to time, especially when Tyo is in a monster-making mood, but in general the amount generated is more than the amount used, and they’re frustrating. 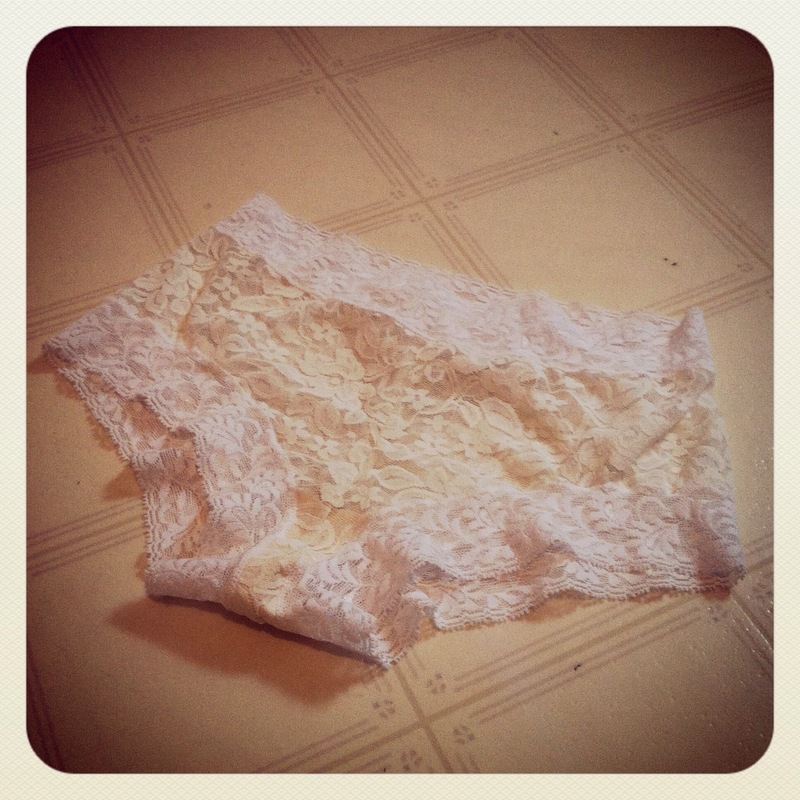 I had not quite a metre (very oddly shaped) of this stretch lace left from a far more exciting yet less practical project that has yet to be blogged, pending a proper photo-shoot. >_< Anyway, I having already cut some Rosy Ladyshorts (cute pattern, free, go make some) from it, I figured I would see if I could squeeze a simple long-sleeved tee out of it using my handy-dandy old knit sloper. Obviously, I could. Not much to say, just a few details—for a light neckline finish I serged a band of white jersey to the neck, folded to the inside, and topstitched down with a zig-zag; it’s soft, a little tidier than just adding clear elastic, but not too heavy, so I think it pretty much hit the mark for what I was going for. 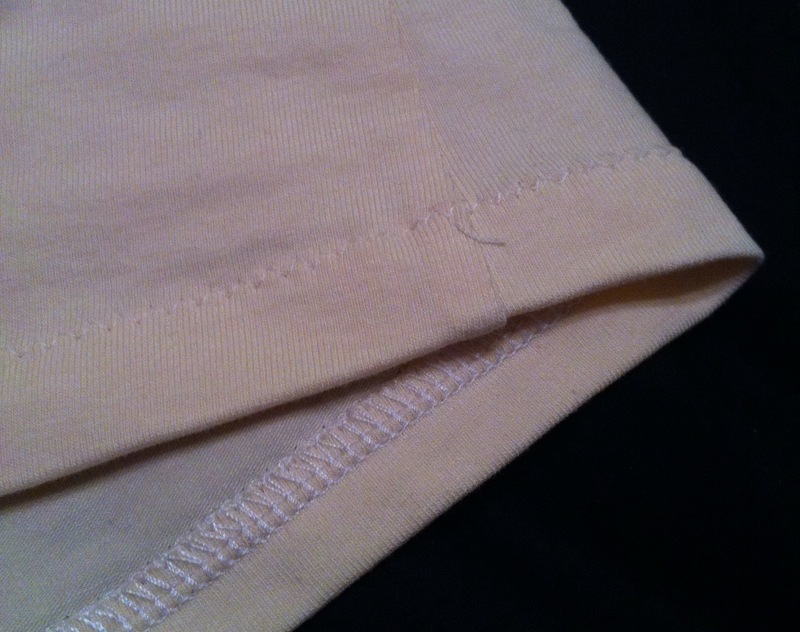 The sleeve hems I just serged and folded over and topstitched—nothing special. 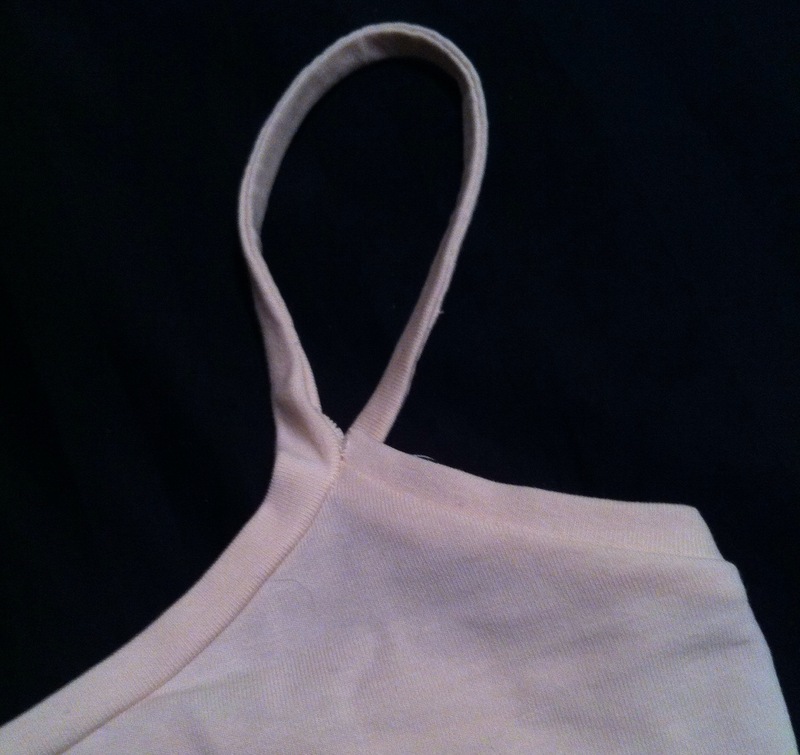 I then needed a camisole of some kind to make the thing wearable. 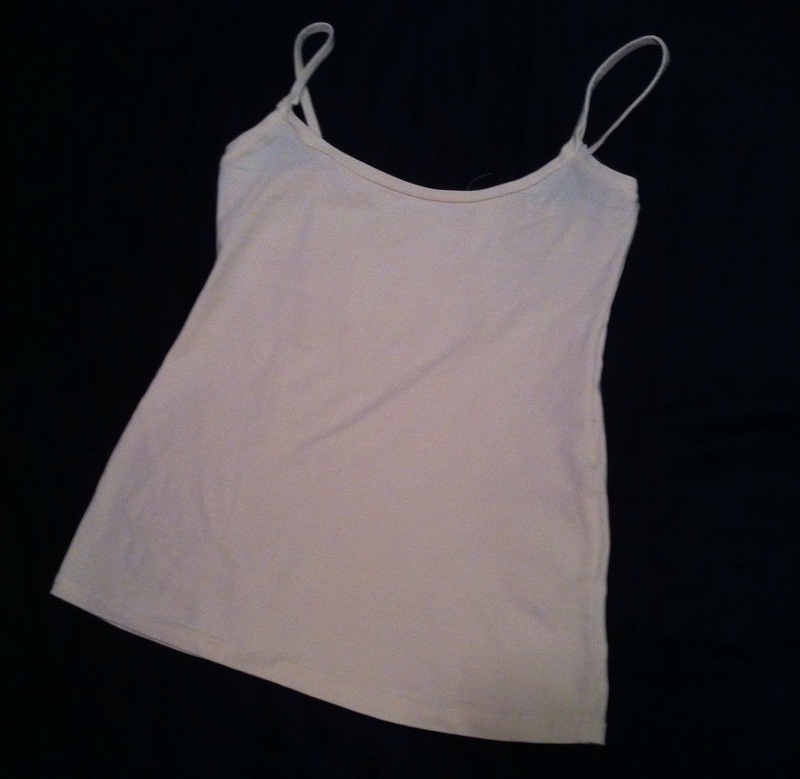 I made one from some cream cotton-lycra jersey; this is really a wardrobe staple I’ve been avoiding making for probably as long as I’ve been making clothes here. 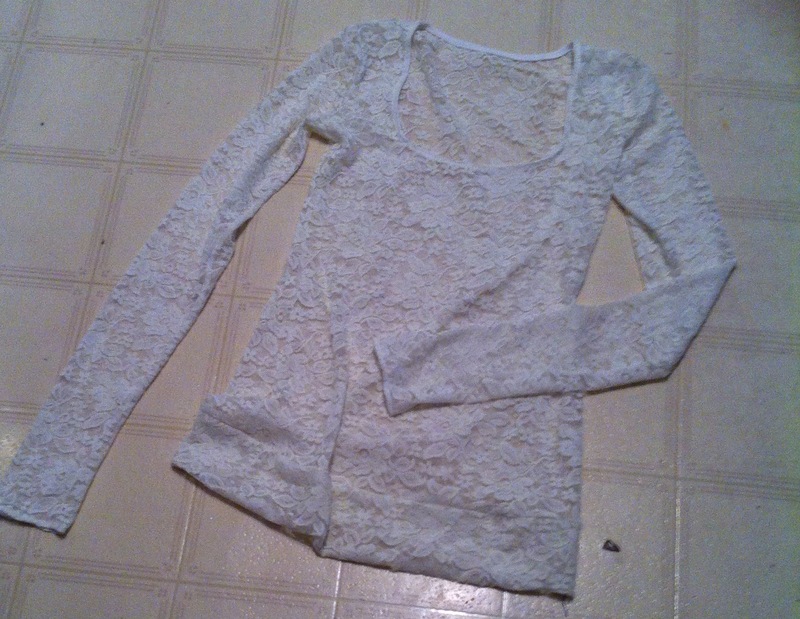 I hacked my knit sloper into a wide-necked curve, (maybe a little wider than ideal, but it echoes the scooped neckline of the lace overlay well) and made a little tank-top. I didn’t have any fold-over elastic in the right colour, however, so I made bands using strips of jersey. If I had been willing/able to to make them as bindings, with the edges folded in, it would’ve worked really well, but with bands turning into knit tubes for the straps… well, there’s an ugly spot at the join. Some hand-stitching could probably pretty it up, but it’s not an ideal method. On the whole, though, it works, and both will be useful (if not terribly seasonal) wardrobe staples. The only tragedy is that I burnt out the motor of my White, which is my go-to machine for knits (other than the serger) about halfway round the hem of the camisole. That was a lot of hand-wheeling to get it finished. >_< Next question: is it worth it to fix such a machine? A new motor can be had online for about thirty bucks (although Sew Classic won't ship them to Canada, apparently. Boo.) and my father-in-law has the know-how to attach one if I can get the right size and mounting-brackets. (This is still more money than I spent on the whole machine, by the way.) It's an internal motor, but still belt-driven and looks just like the external ones, to my untutored eye, anyway. /sigh. It was also my favourite machine to do buttonholes with the buttonholer attachment on. Double sigh. 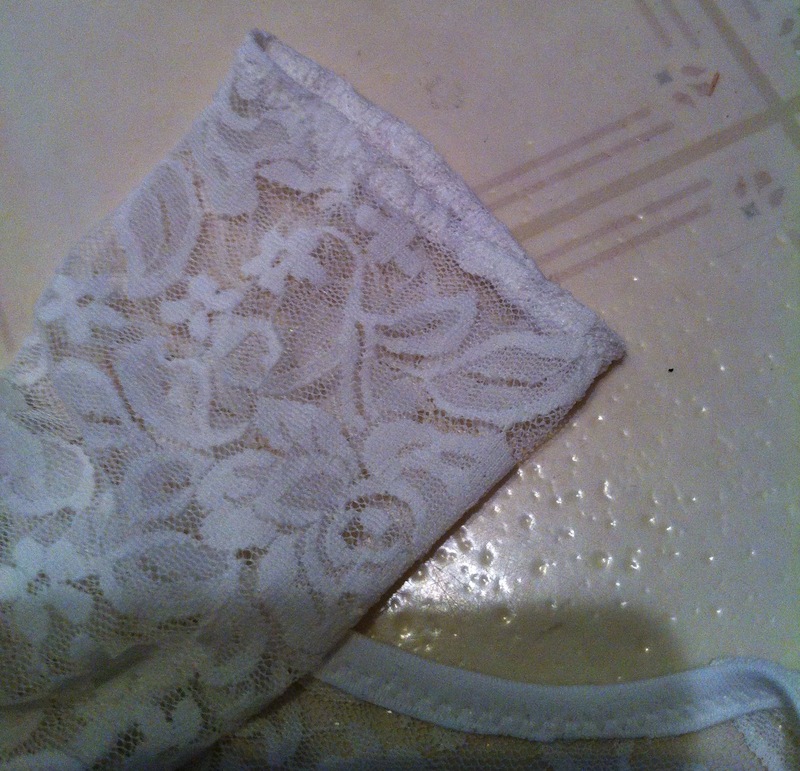 Of course, there’s still a little bit of the lace left. Time for another pair of ladyshorts? Gorgeous! What a terrific use of scraps. I can see why you don’t want to throw anything away! Very nice top and cami! If your machine is old enough to be all metal, then yes, you should definitely get a new motor. Old machines are worth spending money on. If it’s a modern plastic thing, it’s probably better just to go looking for a new machine all together. Oh nice! Fix it if you can! They don’t make them like that anymore. I read a rule of thumb about saving/picking up stuff for later: if you know what you are going to do with it and you will do that within 60 days, save it. Otherwise, pass it up, another will come along. except for sewing machine motors….. 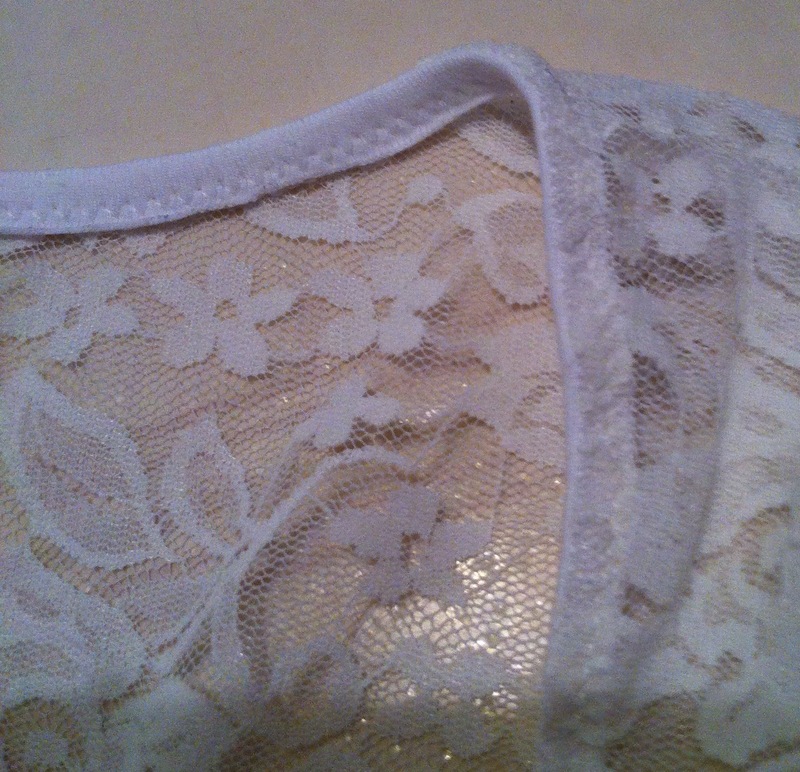 I like the way your camisole mirrors the neckline of the lace overtop, looks much better that way. Sounds like the machine might we worth it; after all, you are comfortable using it, your fix should extend its life massively, and it will cost far less than getting anything half decent to replace it. What a sad story about your sewing machine! I have been known to have old equipment (a vintage knitting machine) repaired at more cost than the purchase but that wasn’t anything major like replacing a motor (it doesn’t have a motor) and I knew I was unlikely to find a cheaper one in working order. I guess that’s the real issue here: Can you use other machines to do the jobs this one did, and do them as well? Or can you get another machine to do that cheaply? And is there any guarantee spending the money on the new motor will restore the machine to its former glory? I like your top(s). I also obsess over using up every remotely useful bit of fabric, so I completely understand. And I’ve put off making basics like camisoles for a long time. It’s just a lot of work for something so simple. The necklines work well together though. Much nicer than they would have if you had used some RTW camisole. I have the same problem getting rid of biggish ‘scraps’ too. I have just bagged up some to give away on free cycle as they are big enough to make kids clothes but little kids. I am making some into undies right now. I don’t go into making pouches but that would use some up. 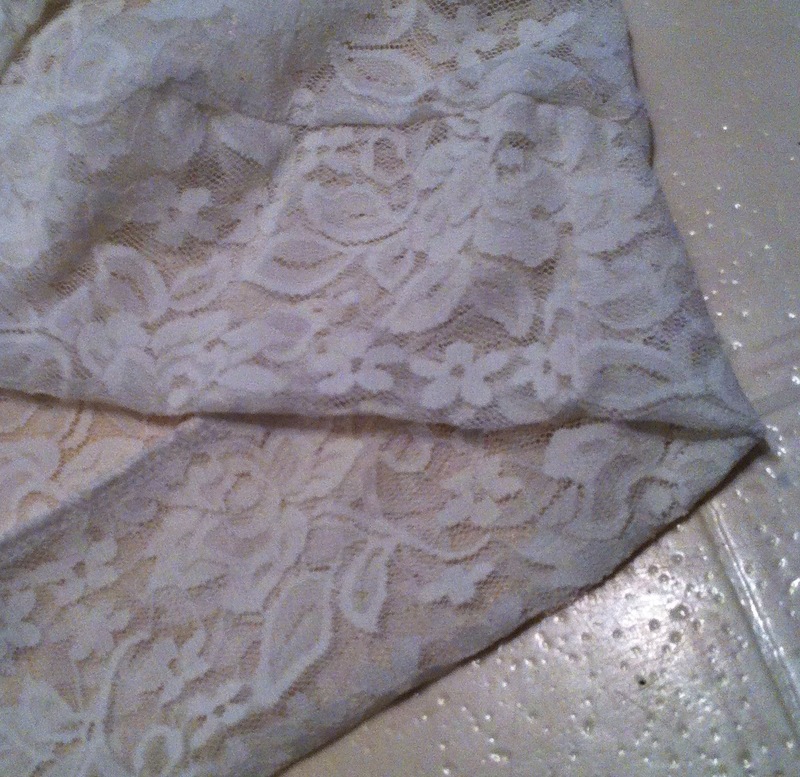 I love your lace top… it will be very useful me thinks. Oh, do you say undies (underwear)? Oh sorry about your machine… what to do, what to do?? So pretty! So you recommend the Rosy Ladyshorts then? I have the pattern, but I haven’t tried it yet because I’d always just used the Kwik Sew that was my TNT….sadly, I lost my modified pattern pieces in the move, so I’m back to square one anyway. I had that problem with my old Bernina 830, while finishing a quilt. I took it to the old sewing machine guy who fixed it, saying that the motor needed new brushes. Inexpensive repair and DH nodded with understanding about the brushes. Whatever they are. Take it to your OSMG and enjoy many more years of sewing with the machine. Just have him get another motor for you and your FIL can attach it. I’m sure that he’ll like getting the machine back to work for you. I may have to try out that cute ladyshorts pattern! I have the same problem with having to keep scraps, but don’t ever actually do anything with them, which is problematic. I have visions in my head of all the nifty things I’ll do with them one day… turns out I need more one days. 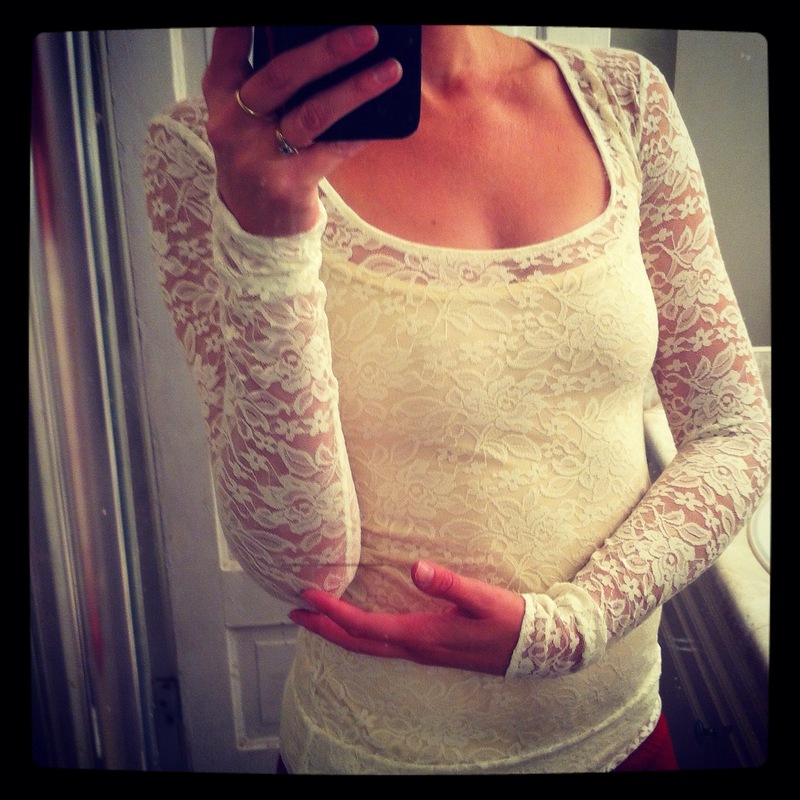 Your camisole and lace top are very cool, and they seem to be to very much your style, I can see why they’ll be staples. I think they look lovely on you! And that’s so sad about your machine! Good luck whatever you decide to do, but I hope it lives again.